We are just about to enter the longer evenings where we can once again return to getting some decent quality deep-sky images. To be frank, it never really gets dark enough to do good work for all of June, and most of July. So this month, as we are still effectively in summer, with the summer triangle overhead, our object is (as usual for August) something in Cygnus. That something is the bright star Sadr, the central star in the constellation – and as you can see from the accompanying image – it is completely surrounded by emission nebulosity – so this is a nebula image for a change. Again – considering the deep-sky image as a whole – just a mass of red (emission nebulosity) can look very boring. It is much better if you can break up the monotonous red region with something interesting – like a reflection nebula [NGC6914] which lies a little north of the current region. In the present case I have broken up the red monotony by placing the bright star Sadr in the centre of the frame. This must have also impressed the APOD guys as this image made APOD for January 4th 2007. Sadr is the supergiant star Gamma Cygni and the two “winged” regions to the left of Sadr form the Butterfly Nebula IC1318. Above and left of Gamma Cygni are the stars forming the group NGC6910. 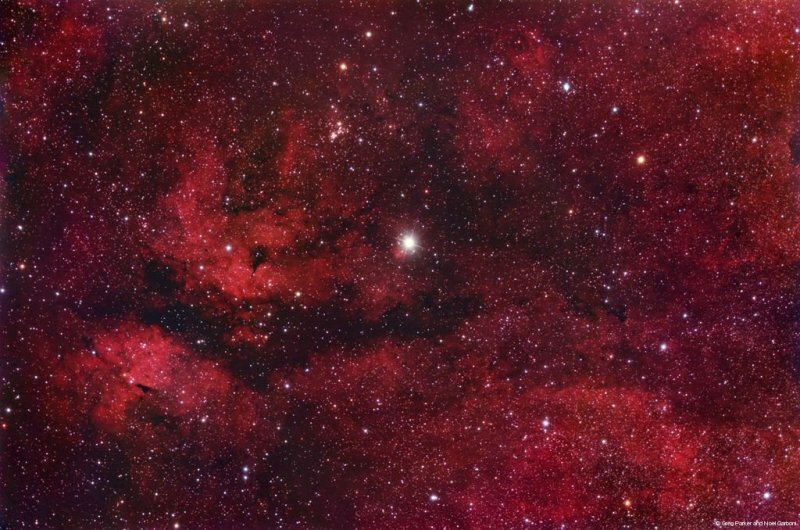 Gamma Cygni lies at a distance of only 750 light years, while estimates for IC1318 and NGC6910 vary from 2,000 to 5,000 light years. We’re coming up to my favourite imaging month now -for the first time since May we get decent dark skies that will yield us the best quality images.